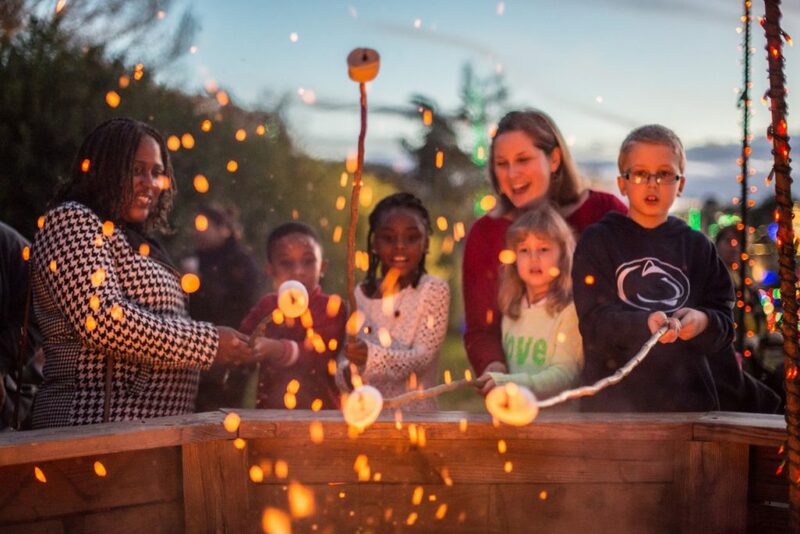 S’mores at the Kelleher Warming Fire are just one of the experiences your loved ones can have when you give the gift of garden membership. Image by Caroline Martin. If you are like me, you are always looking for new ideas for gifts. So many of us already have too many things, more than we can use or store. And sometimes because of this, it’s hard to find a gift that will really make an impact on someone we love. So, more and more, people are turning to experiences, rather than things, in their gift giving. According to Science Daily, the reason experiential gifts are so memorable is that often they cause a strong emotional reaction during the experience. And, if you are buying for a young person, this advice is even more true. A study by Harris Group showed that 72 percent of millennials would prefer an experience over a material gift. Experiences help form who you see yourself as and create lifelong memories that you visit in your mind again and again. So, if you don’t need any more socks (one of my mother-in-law’s favorite gifts years ago), and you don’t need a new Christmas sweater, consider giving the gift of experiencing time in a beautiful place. Nature is healing. Time with family and friends outdoors is important. And we’d be honored if you’d spend some of your quality time with us. We think our Garden Members are pretty special. Garden Members get free unlimited daily admission to Lewis Ginter Botanical Garden. They could literally come to visit us every day! They also get free admission into Dominion Energy GardenFest of Lights on Member Nights. You can buy a gift membership in person or online. Online is the best option if you procrastinate, like me. We have more member benefits than we can list here, so go check them out. What you need to know: December 14 at midnight is the last chance to order a gift membership and be sure that the recipient will receive their welcome package from the Garden with their membership card in the mail before Christmas. After December 14, you can still purchase a gift of membership online and print out a gift certificate to give to your recipient. 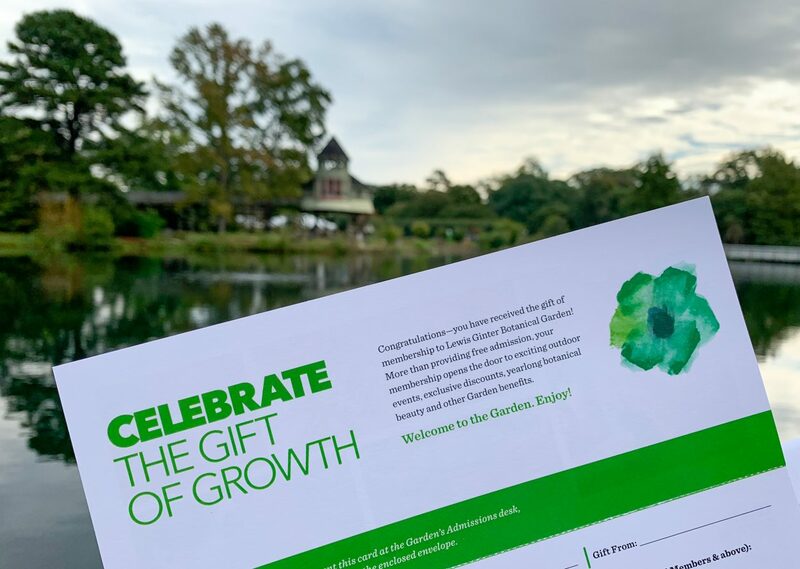 This year’s gift cards have a new look and feature Lewis Ginter Botanical Garden’s new branding identity. For years and years, we’ve had paper gift certificates that you could use at the Garden. This year, we’ve got something really special: gift cards! (As you can see, they are quite beautiful and tie into our new brand.) Our new gift cards can be used for so many things. 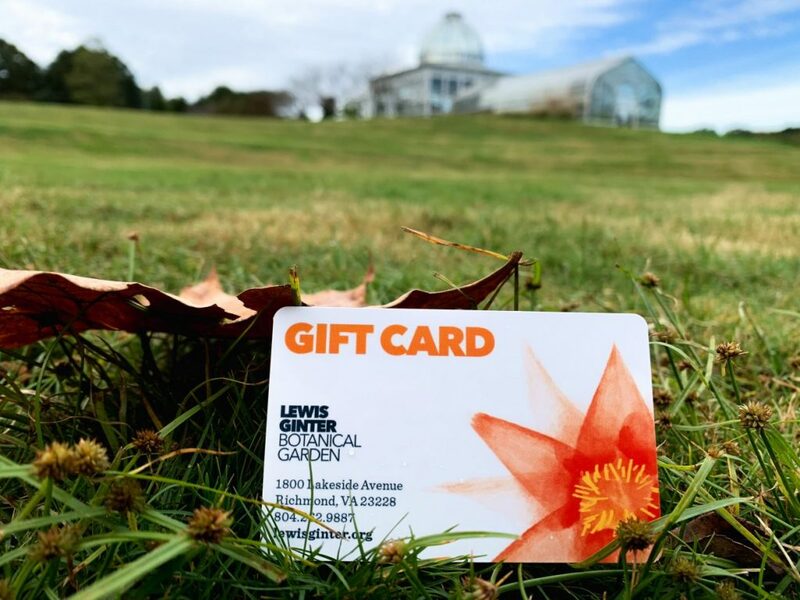 Yes, of course, they can be used in the Garden Shop, but they can also be used towards Garden Membership and admission to Dominion Energy GardenFest of Lights. The gift cards come in any denomination and you can buy them at our admissions desk or in the Garden Shop. Bonus: Our on-site food provider Meriwether Godsey offers gift cards too! These are valid in the Garden Cafe and the Robins Tea House, which is even open for dinner on select nights during GardenFest! Studies show that experiential gifts provide greater satisfaction than material gifts.